President Stroble welcomes conference participants to Webster, where academic programming emphasizes opportunities for students to conduct and present research. 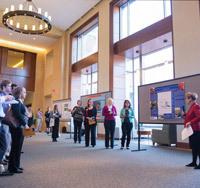 The fall Research Across Disciplines conference brought students from Webster University and other St. Louis-area universities to campus for several days showcasing undergraduate research during the second week of December. Co-presented by Academic Affairs and the College of Arts & Sciences, the growing conference combines posters, oral and creative presentations and roundtable discussions to give these students valuable experience in communicating the findings of their research. 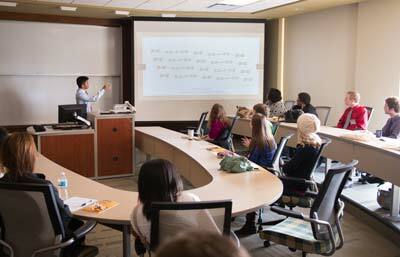 Between the conference's two main days on Dec. 11-12 and the Crossing Borders: Language and Power keystone presentations on Dec. 8 and 10, more than 50 students presented research during the conference. What began as an undergraduate sciences conference has grown to include research representing academic and creative disciplines across the spectrum, from anthropology to administration to audio production. Research topics presented last week ranged from the impact of bacteria in birds to international human rights, literature and media coverage of Ferguson. in their fields and network work with fellow researchers. In addition to Webster students, the December conference included presentations by students from Maryville University and Lindenwood University. The goal is to showcase the scholastic and creative efforts of undergraduate and graduate collegians from around the region and across a variety of academic fields. For students, it serves as a great opportunity to gain valuable experience as emerging contributors in their fields and to network with fellow researchers and professionals. Danielle MacCartney, associate dean of the College of Arts & Sciences Division of Liberal Arts Programs, said RAD’s evolution “reflects Webster’s expanding commitment to supporting independent and student-faculty collaborative scholarship opportunities across all of higher education” — opportunities which serve students well both in school and beyond. Plans are already underway for the next edition. The spring conference is scheduled for April 29-30, 2016, with a submission deadline of March 12. Visit webster.edu/rad for the latest information. See more photos from the December conference in this Facebook album.